Most of us were introduced to Morrissey when he was fronting the Smiths in the ’80s. Even in the ‘80s Morrissey was speaking to the feeling that his records would speak to deeper political motivations and his zealous views of society. His latest release, Low in High School, again sees him focusing on his purpose: a spokesperson for melancholy with political and social observations and opinions. 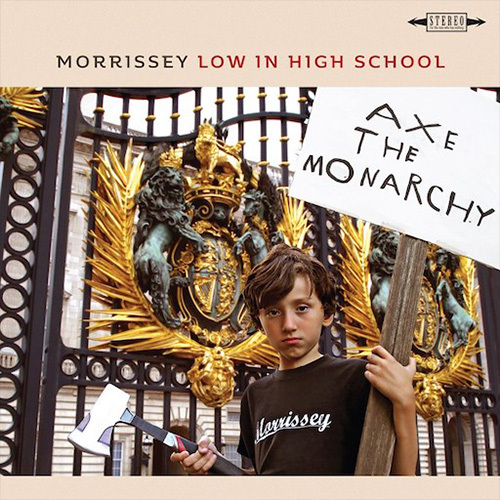 Low In High School finds Morrissey in a good storytelling mood though, still grumpy, but the music and singing is right on the mark. Like World Peace, Low in High School is produced by Joe Chiccarelli, who enjoys exploring new sounds and bringing out the best in Morrissey and his band. There are new sounds, like horns and as for Morrissey, he visits vocal territory we have not heard in years. The music is often engaging and exciting, the lyrics are predictably prophetic, cynical, heartening, and ultimately will elicit some sort of reaction from their bold statements. That’s the short of it! Morrissey loves controversy and Low in High School is no exception. The political jabs the views of the world and the short comings of society, but all in all, it's good to hear Morrissey back in form with his singing and musical direction. Undeniably, there are few awkward moments lyrically, but his boldness to write his opinions that do not fit the norm is what makes Morrissey. Morrissey has a terrific, albeit imperfect, way of writing lyrics. His pen is eclectic, eccentric, adventurous, provocative and rather lovely at moments. Low in High School is an album that finds a more mature Morrissey, one that is complex and richly rewarding. The album has new sounds and Morrissey’s singing in top form and with repeated listening, this is a gem of a record. As philosophical alternative-rock songwriters go, the man is peerless.